The misal of courage and efforts is what Sitabai Misal offers ones. It’s just not about a misal but it’s about her passion, though her age (90) it never became a hindrance in her work. After her husband suffered severe paralysis she has taken over the household and earning responsibility for her family. With all her fruitful efforts she has created a her own Misal Brand by name “Sitabai Misal”. She has 2 sons one daughter both sons are settle and working and her son in Law is PSI. Sitabai is live example of ‘where is the will there is the way’ and a can say an inspiration for the young generation. The way she has overcome her problems and family crisis is really commendable. Today her day starts early in the morning with the preparation of “Yellow Shev” she cooks the misal and prepares the Shev alone without taking help from anyone. And her hands do not sake in this old age because when the work becomes passion it gives you strength from within. Her misal is enjoyed by everybody irrespective whatever the age is ‘pacchpan se leker bacchpan tak’ all just love the yummy tasty misal. And the spice in the misal does not cause harm to health. Don’t expect much on the ambience but for sure you can expect a mouth-watering Misal here. The traditional taste of the misal can be tasted only at Sitabai’s Misal though some new competition has started the same traditional misal in the city but the taste of Sitabai Misal is unbeatable because experience adds different flavor to her misal. 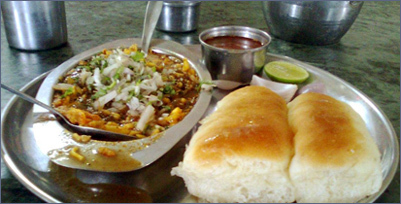 This Misal Pav gives you feeling of satisfaction. For sure this misal is exception which doesn’t bring tears in your eyes while having it. A very simple and healthy Sitabai’s Misal, if you haven’t tasted yet… You are missing the delectable dish which makes a great breakfast or brunch. A misal eating experience can’t get any more bucolic than this.